Kotak Securities was founded in the year 1994 and it is a subsidiary of Kotak Mahindra Bank. Through this post, you shall get a complete Kotak Securities Review, Trading and Demat Account Opening Charges & Brokerage Charges. Ina addition to it, you shall also get to know some of the salient features of opening a demat account with Kotak Securities. Kotak Securities is one of the fastest growing stock brokering house in India. They are the corporate member of Bombay Stock Exchange (BSE) and National Stock Exchange (NSE) as well. It has Depository Participant with both NSDL and CDSL. Kotak Securities is present across 359 cities with 1209+ branches, franchises and satellite offices that serve 11.95 lakh customers generating 5 lakh trades daily. So, you can have a seamless trading experience. Maintenance Charge: Rs 50 per month for resident Indians, Rs 75 per month for NRIs. The plan opens the gateway to the world of investing opportunities for you. The account is specifically created for those customers who are looking for a good bargain on their brokerage rates. Enjoy higher returns by investing early through Easy IPO. Access to Kotak Securities’ research reports on the economy, select industries and companies, which help you make informed investment decisions. Research advice via Kotak Securities SMS alerts, so you don’t miss out on important buying and selling opportunities. Buy and sell stocks on phone using the Call and Trade facility. Access to the top-performing mutual funds through Easy Mutual Fund. Free news and market updates. Exposure of up to 18 times your initial margin on selected stocks with the Super Multiple features. Free access to KEAT Pro X. The scheme is well suited for new investors in the market. Best suited for new investors which charge fixed brokerage despite varying amount of traded volume. Get access to Kotak Securities Knowledge Center, which helps you learn more about stock markets and investments. Access to trading alert via Sms and email which include buy and sell recommendation. Easy access to the new companies listing on the stock market by investing in IPOs in the primary market. Take advantage of the margin trading to enhance your profits. You can get exposure of up to 18 times your initial margin on selected stocks with Super Multiple. Trade in currency derivatives through your Fixed Brokerage Kotak Gateway account and mutual funds through Easy Mutual Fund. The Advance Fee account helps you earn back your brokerage charges. You pay a certain amount in advance, and slowly get it back as an when you trade. To encourage consistency in trading, the scheme provides extremely low charges during the validity period. The plan rewards your steady trading. The plan is available under different categories with Rs 5000 to Rs 2 lakh with a validity period of 12 months. This plan offers a very competitive price on brokerage plans and currency exchange rates by investing in India. This is an ideal NRI investment plan in India. An average quarterly balance of Rs. 10,000 should be maintained in the savings bank account. The scheme is specially designed for festive season for specifically trading in the Derivatives segment. In the Equity Options trading, a flat brokerage of Rs. 21 per executed lot . What you need to do is to bring a minimum cash margin of Rs. 1 lakh only. 100% cash margin is mandatory for trading in derivative segment. Whereas if you wish to trade in the Cash segment, they accept margin in the form of cash, securities and other acceptable form of margin. Also, the Shubh Trade option is available for trades placed on their online platform only. Call & Trade facility will be charged at Rs. 20 for placing trades in Options only. Whereas for trades in Cash segment and Futures, the standard pricing shall be applied. So, the first 20 calls will be free. From the 21st call onwards, you’ll be charged Rs. 20 thereon. Dealer assistance will be provided for placing trades in Cash segment only. Happy hours will be announced on our trading platforms. Only square off trades which are placed and executed within the Happy Hours will get this offer. Only square off trades which are placed and executed within the Double or Quits Hours will pay one paisa brokerage or double brokerage. If you book a loss on your square off trade, we charge one paisa brokerage at scrip level. If you make a profit on your square off trade, we will charge you double brokerage. Double or Quits hour is declared on their trading platforms. You can choose to participate in this product any day, as per your interest. KEAT ProX: It is a free, simple and high-speed web-based trading platform. You have control over your portfolio and track the live markets. Not only this, you can buy and sell securities online that too in real time. KEAT ProX deals with scrips on the BSE, NSE and NSE Currency markets. Kotak Stock Trader: It is a mobile-based application. You can trade from your mobile phone anywhere. Fastlane: It allows better trading experience from workplace and doesn’t require application to install and features are similar to KEAT ProX. Xtralite: It is an extra-light, super-fast trading website specially designed for trading using slow internet connections. Dealer-Assisted Trading: Dealer helps in carrying with your investment transaction with investment advice and execution of the trade. Call & Trade: It allows you to trade when you don’t have access to the computer through dealer and relationship manager. Through their customer help desk toll-free numbers. By visiting a nearest branch or through sub-brokers. One photograph of nominee you wish to make (optional). Xerox self-attested copy of PAN card. Xerox self-attested copy of address proof like Passport, Aadhar card, Voter ID, lease agreement etc. It provides a decent service for its customers through its three-in-one account. All financial products and services are available under one roof. Monthly and weekly Research reports for its customer and flexibility of choosing trading platform. High brokerage charges and hidden charges. In mutual fund, direct funds are not available. Commodity trading is not available. Kotak Securities is a reputed and user-friendly stock broking company. It offers its customers a flexible system through various brokerage plans and trading platform. From the cost perspective, the services offered seem to be a bit costly as compared to other popular discount brokers. But, the weekly and monthly research reports generated for customers help them to make take trading and investment decisions more effectively. Q. How long will it take to get access to place trades? A. When you fill up the form on the website and make the payment of account opening fee, you will receive the account opening kit at your correspondence address. You should receive the account opening kit within 3-4 working days after your payment is received. On receiving the form you can submit it to Kotak Securities along with necessary KYC documents. It generally takes 7 working days to activate the account from our side after receiving the complete form. Q. What documents will I receive when my account is opened? A welcome letter containing details of your account with us. A CD that will help you install K.E.A.T. A Personal Identification Number – a unique numeric code for one-time use for account activation. You will also receive the initial password on your email id registered with us. Q. What is the least amount of margin that I need to pay Kotak Securities to start trading? * The information displayed here are sourced from the official website of Kotak Securities Ltd. 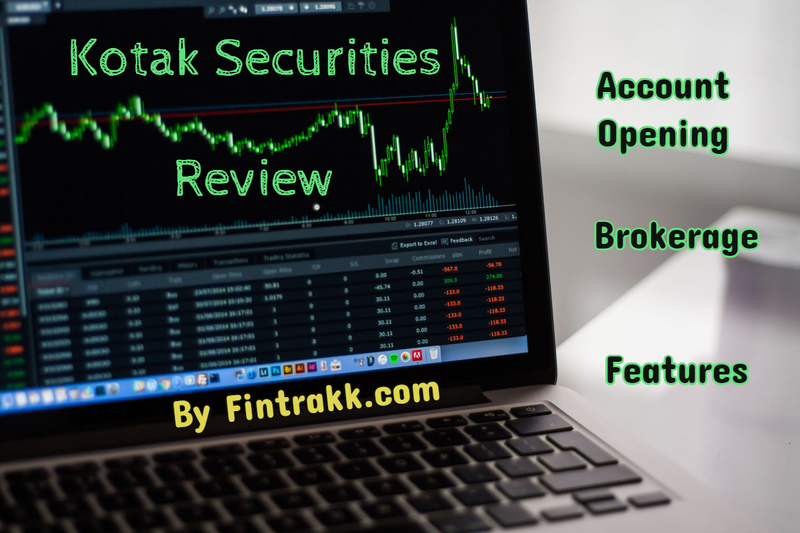 This was all about Kotak Securities Ltd. account opening, brokerage charges and other details. What do you think about it? Where do you prefer opening a demat and trading account? Feel free to share your feedback on any of the stock brokers services that you use.